The best business email providers offer a secure, spam-free email experience on a stable system. We looked at more than a dozen email providers and narrowed the list down to the top six, comparing each on price, attachments and data storage, security, accessibility, spam and virus protection and available integrations, finding the best overall. All businesses need an email address that can be accessed quickly, securely and reliably with enough storage to keep messages from bouncing. However, some companies only need a single address while other businesses require a scalable email solution. For that reason, we looked at a range of options that can serve anyone from the sole proprietor wanting a free address to a growing business with multiple employees. Based on the criteria above, we’ve determined G Suite is the best email service provider for small business. While it is not the lowest cost option, it’s overall reliability, available productivity tools, best-in-class security practices and ease of integration with other products is the reason it is the dominant provider in the market for small business. G Suite is the parent group of Google’s email service, also known as Gmail. Starting at $5 per user, per month, G Suite features tools like email delegation designed around supporting business communication and collaboration. G Suite is the best email provider for businesses that need an email provider with easy access to great apps like Google Docs, Google Sheets, and Google Slides. G Suite’s pricing starts at $5/user per month for their basic plan and $10 per user, per month for its business plan. G Suite also offers an enterprise level plan that includes advanced customization and pricing is tailored to a business’s specific needs. G Suite’s pricing but doesn’t include web hosting services. G Suite’s Basic plan costs $5 per user, per month and gives users access to email via the Gmail browser tool, which includes email delegation, email recovery, spam protection, offline access, and attachment previews. G Suite also provides access to the business suite of Google Docs, works with third-party apps, includes 30GB of document storage and offers a guaranteed uptime of 99.9% with best-in-class security certifications. However, the Basic plan does not come with a vault for ediscovery and archiving of documents saved in Google Drive. Therefore, G Suite is the best business email provider for teams that want a highly reliable email solution as well as access to Google’s suite of productivity tools. The Business plan costs $10 per user, per month and offers all the same email benefits as the Basic plan. Like the entry-level plan, users have the option of setting up an approved sender list, allow a co-worker’s email using the same email domain to bypass the spam check or to increase the stringency of Google’s default spam filtering. However, unlike the Basic plan, this tier gives users a vault for ediscovery of documents as well as archiving. The Business plan removes the limit on document storage if there are five or more users on the plan. Therefore, it is best for teams that need email and want the ability to create more documents or collaborate more easily and securely in the cloud. The Enterprise plan costs $25 and includes all the same functionality as found in the Business plan as well as additional features like data loss protection and access to third-party archiving tools. It also offers more robust ediscovery and security tools than the Business plan. The Enterprise plan offers many additional integrations with third-party applications, such as Microsoft’s desktop Office products as well as the cloud-based integrations available in the lower-tiered plans like Pipedrive CRM, Zoho CRM, Asana, RingCentral, and DocuSign. Therefore, it’s best for teams that want the security and flexibility of Gmail but will be using desktop office tools. The Gmail browser-based client within G Suite does not include bulk clean-up tools like those found in Zoho Workplace or Office 365. It also does not support multiple email signatures or email templates unless you install third-party add-ins or integrate your email with a desktop client. Therefore, the browser client works best for those who either don’t need this functionality or plan to utilize third-party tools. At Fit Small Business, we use G Suite for many of our business communication and collaborations. While Google’s word processing and spreadsheets do not have as many features as those found in Microsoft Office suite, its mail works well regardless of mobile and desktop device making it a flexible and affordable option for small business owners. G Suite gives you all the tools you need to work together in a single package that works desktop, tablets, or mobile devices. Best of all, you start using its professional email as well as its suite of office productivity tools for free for 14 days. Visit G Suite for details. Zoho Workplace is a business email provider that offers a suite of personal productivity tools, advanced analytics, and integration with third-party apps that businesses can start using for free. Zoho is best if you’re looking for a free email address as part of a larger office productivity service featuring reporting and the ability to scale without changing providers. Zoho Workplace is the only solution on our list to offer a free plan that supports up to five users. Paid plans range in price from $1/user per month (billed annually) to $8/user per month and include additional features like multiple domain hosting, email forwarding, and system integration. Zoho Workplace’s Free plan includes webmail-based email and single domain hosting for up to five users. While the plan includes 5GB of storage, free email addresses, and attachments up to 25MB, it doesn’t include the advanced email functionality found with Zoho’s paid plans such as internet message access protocol (IMAP) and post office protocol (POP) support, or integration with other tools like Zoho’s in-house document writer, chat, and video conferencing. The Free plan is best for solopreneurs or teams of less than five who want a no-frills email service that’s set up and use, regardless of the customer’s technical abilities. It is also good for those who only need webmail-based email and don’t require access to additional tools like document writer, website builder, or Zoho chat. 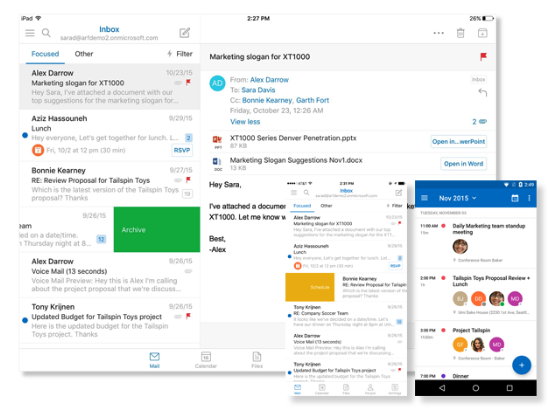 Zoho Workplace’s Mail Lite plan includes features like IMAP and POP support letting you work with your email in your favorite native email client and costs $1 per user, per month, billed annually. The Mail Lite plan also comes with multiple domain hosting, meaning you can manage more than a single site from your account as well as domain aliases and 25GB of data storage. However, unlike the Standard plan, the Mail Lite plan does not include more advanced features with their other business productivity tools like group sharing of documents. Therefore, it is best for small teams that do not require group sharing and those that don’t need more than 25GB of data storage. The Standard plan allows users to customize the look of their user interface with their company logo and costs $4 per user, per month. It also gives users 30GB of data, and the attachment limit remains 30MB. However, the Standard plan doesn’t include Zoho’s ediscovery functionality, which helps you find any file across the organization. Unlike close competitor G Suite, it also features advanced document analytics. Teams using the Standard plan may have to send more emails to teammates with links to a file’s location but still makes it a good option for those expected to exchange large files over email, such as designers or salespeople with graphics-heavy presentations. The Standard plan is also a good choice for organizations that want to emphasize the importance of their brand by making it appear in every aspect of their business. The Professional plan costs $7 per user, per month and increases the combined storage to 100MB of data while the attachment limit is increased to 40MB. In addition, the Professional plan provides video conferencing for up to 100 participants and cloud storage for up to 25 recordings. For these reasons, the Professional plan is a good choice for teams who want to reduce their reliance on email for internal communication and collaboration. It is also a good option for teams that need to use significantly more storage data per user. Zoho Workspace can integrate with many third-party applications including Google Apps, but currently lacks G Suite’s brand awareness and ability to sign in to other products using your Gmail login. This means you may have to maintain separate logins for those additional services. Users of Zoho Workplace appreciate the tool’s uptime record, spam protection, and security. They do, however, report that the tool can be somewhat intimidating to set up unless you are already technically savvy. While there are no third-party ads on the interface, users have reported that the service does promote its paid services, which can also be annoying. Read more about Zoho and its suite of products on our Zoho user review page. Zoho Workplace is a suite of products designed around business and personal productivity as well as communication and collaboration. It also supports IMAP and POP so customers can continue to use their preferred email client. Best of all it comes with free email for up to five users. Sign up today. Bluehost is a website hosting provider that also offers email hosting as a value-added service with pricing starting from $3.95 per month. It provides email with IMAP and POP support and website hosting plans, making it a good choice for startups that need email services along with web hosting for a new business website. Bluehost offers hosting on a shared server, which ranges from $3.95 to $13.95 at its introductory price, and cloud hosting, which can range between $6.95 and $15.95 monthly. Either option includes a free domain and email, which makes it within a similar price range as Zoho for email with domain hosting. Bluehost Basic shared-hosting plan includes email with features like IMAP and POP support, three different webmail solutions to choose from and email forwarding for up to five email addresses with a 99.99% uptime measured during the past year. Users get 50GB of storage, which is significantly less than G Suite’s entry-level plan with 30GB. It also includes subdomains and parked domains and costs $3.95 a month to get started. 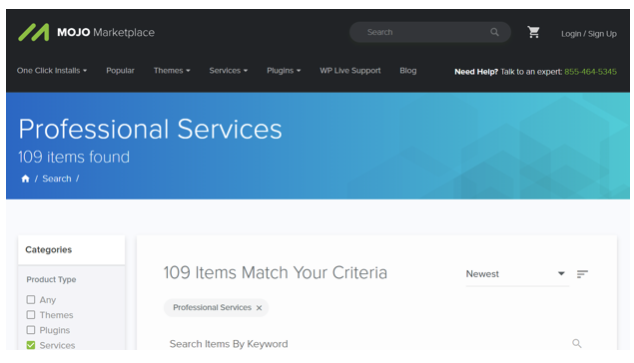 Bluehost is also one of WordPress’ premier recommended partners based on its technical support and its ability to integrate plug-ins that are available through its Mojo Marketplace. Therefore, Bluehost is an excellent choice for startups that are looking for an email hosting service as well as a website hosting partner with WordPress or WooCommerce plug-in support. Bluehost’s Plus plan includes all the same email functionality as found in the Basic plan but removes the limit on email storage, number of parked domains and number of email accounts. In addition, the Plus plan includes access to a feature not offered by G Suite or Zoho Bluehost called SpamExperts with an introductory cost of $4.95 per month. SpamExperts is the name of Bluehost’s spam management and advanced email administer tool. With it, email users can view a quarantined message, manage personal email settings, whitelists and blacklists and specify an incoming delivery queue as a way of reviewing and controlling incoming spam. The Plus plan is best for teams looking for email hosting services as well as a website hosting partner and more robust spam control. The Choice Plus plan offers the same email functionality as the plus plan along with access to SpamExperts but also includes domain privacy. The plan has an introductory cost of $5.95 per month — matching that of the Plus plan — and a regular price of $14.99 per month. Bluehost gives users secure socket layer (SSL) security for transactions on your website, but some third-party plug-ins can affect the security of your data. Domain privacy can help shield your data from external threats on the shared server. Therefore, the Choice Plus plan is best for businesses wanting additional security on their email as well as more robust spam control and a website hosting partner that can support plug-ins. The Go Pro plan is nearly identical to the Choice Plus plan, but your business email and website are hosted on a high-performance server at starts at a cost of $13.95 per month. The high-performance server gives you faster access to your email while also resulting in a faster website, a feature not found with Mail.com or G Suite. 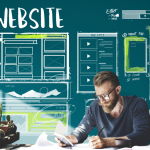 The Go Pro plan is, therefore, best for teams in need of email and a website hosting partner that can support plug-ins and want the best possible user experience. However, none of the shared hosting plans include automatic site backups or system restores. Bluehost is designed to help you make the most of your professional website. Unlike Zoho, G Suite, or Office 365, it does not offer bundled office productivity tools. Therefore, it is best for companies that need a professional website and email addresses but does not need those additional tools. Bluehost users report an overall good experience with Bluehost, saying it easy to use with average to good customer support. They also like the price of Bluehost compared to other similar web hosting solutions. Some users have complained that websites speeds could be improved. You can read more about Bluehost on our Bluehost user review page. Businesses looking for an email service that’s bundled with web hosting should consider Bluehost. You can take advantage of their limited time $2.95 introductory offer by signing up today. Visit Bluehost for details. Office 365 is a business email provider with a suite of productivity tools, including word processing and spreadsheets, built around Microsoft Office products. Plans start at $15 monthly and are packed with features that may be more robust than smaller businesses need, so Office 365 is best for larger teams already familiar with Office products. The Office 365 Business Premium is $15 per month and includes email hosting with a 50GB mailbox. It also features desktop and web-based versions of Word, Excel, and PowerPoint. Office 365’s pricing is among the highest on our list, but access to the Microsoft Office suite makes it a good value for the money. Office 365’s Business Premium plan includes business-class email, differentiating it from Office 365’s standard Business plan which does not. The Premium plan also features a custom email domain address, 24/7 phone and web support, and Microsoft’s chat-based workspace, Teams. Microsoft Office 365 includes 50GB email box and 1TB of OneDrive storage. Bluehost offers unlimited storage space but doesn’t feature Microsoft’s range of collaboration tools like Word, Excel, or Teams. In comparison, G Suite also comes with unlimited storage but lacks a digital notebook service like OneNote. Office 365 includes data loss prevention and multi-factor authentication, similar to G Suite. It also features message encryption that allows users to send encrypted email to anyone regardless of what email service recipients use. Email is accessible online through a browser on a desktop computer, phone, and tablet, and offline via the included Outlook app. Like Bluehost, Microsoft comes with a 99.9% uptime guarantee. Office 365 has built-in spam and malware filtering tools to protect inbound and outbound messages. Admins can adjust antispam settings in Microsoft Exchange to suit the individual needs of the organization. Like Zoho Workspace, Office 365 comes with its own set of collaboration and productivity tools such as Word, Excel, video conferencing, and team messaging. While that reduces the need for the service to integrate with many products outside of its own platform, it doesn’t feature integration with customer relationship management (CRM) software some sales teams and companies rely on. While Office 365 is a terrific option for teams and businesses that are already familiar with tools like Word and Excel, it does integrate with as many newer business tools emerging in the market designed to help automate business processes as G Suite does. For this reason, it’s best for teams whose primary businesses needs are met with Microsoft products alone. Users who have transitioned from the desktop version of Microsoft Business to Office 365 love not having to worry about backing up data on their servers. However, have reported some compatibility issues between the two products. Email users also complain about the difficulty to delete more than five messages at a time using the web app. You can read more about what other users are saying about Office 365 on our Office 365 user review page. If you have a Windows-based computer, chances are you already have Office 365 tools installed on your machine as part of a Windows upgrade. Therefore, getting started using Office 365 is as easy as clicking on an icon and walking through sign-up using one of their setup wizards. Visit Office 365’s website to learn more. Rackspace is a business email provider with IMAP support for desktop access and Microsoft Word and Excel. With plans from $2.99 per user per month, it also offers domain hosting and ecommerce support as secondary services, and 100% guaranteed uptime, making it best for businesses with mission-critical needs requiring email access at all times. Rackspace email pricing ranges from $2.99 to $3.99 per user per month and gives you access to email using your company’s professional domain, making it a less-expensive solution compared to G Suite or Office 365. Like Bluehost, Rackspace offers domain and ecommerce hosting via the cloud, although both come at an additional fee. Rackspace’s Basic plan costs $2.99 per user per month and offers free email migration, premium spam and virus protection, and 25GB mailboxes. It also includes Outlook which, unlike G Suite, allows automated email scheduling, as well as web, and mobile access to email and unlimited email aliases so users can set up different email addresses without creating another account. The Basic plan doesn’t come with the file storage or instant messaging found in the next plan. It also doesn’t offer generous cloud storage space or bulk delete like Zoho Workspace’s similarly priced plan. Therefore, the Basic plan is best for businesses wanting a cheap business email service that’s not cluttered with features they don’t need. Rackspace’s Plus plan adds 30GB of file storage and instant messaging. It also includes a selection of Microsoft Office compatible apps so users can open, edit, and save Microsoft Word, Excel, and PowerPoint files online as well as ActiveSync which connects mobile devices to Microsoft Exchange for access to email, tasks, and more. While it’s possible to sign up directly through Microsoft for these features, they don’t guarantee 100% uptime. The Plus plan includes a generous amount of file storage. However, it doesn’t offer email archiving like G Suite and FastMail. However, unlimited storage for archived email is available as an add-on to the Plus plan for $6.99 per user per month. The Plus plan is best for teams that use Microsoft Office products and already have an alternative email storage solution. Rackspace offers email, calendars, instant messaging, tasks and some light word processing and spreadsheet manipulation. However, it lacks the suite of more robust office productivity and collaboration tools offered by either G Suite, Zoho Workspace, or Office 365. Rackspace users like the simplicity of the product. It offers the key functionality they need without any of the extra features they don’t use. However, they do wish the tool allowed them to mark tasks as complete. There are complaints about the lack of documentation addressing technical support questions, but users say this isn’t a huge problem due to Rackspace’s live technical support. 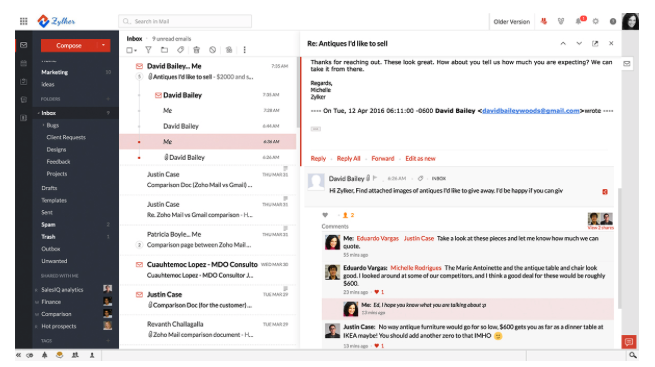 Rackspace’s low-cost entry point makes it a bargain for micro startups or those who only need the most basic email functionality and a custom domain, but also want access to productivity tools like Excel and Word. Learn more by visiting Rackspace today and signing up for a free 14-day trial. 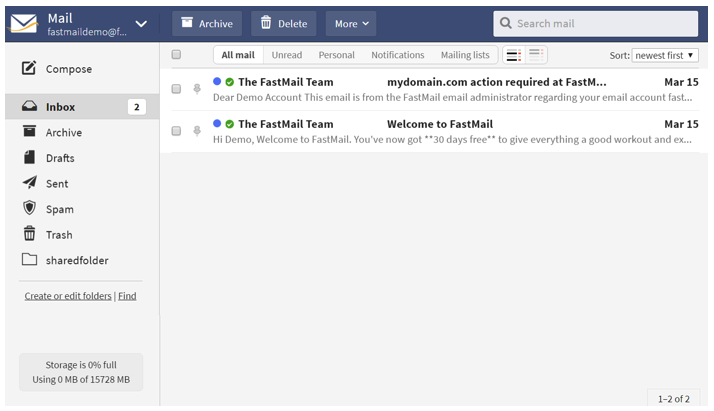 FastMail is an email service provider with plans from $3 monthly, per user. Its ad-free interface supports 36 languages and includes cloud storage space and unlimited archiving space. It also offers full mobile sync with push to mail, contacts, and calendars. FastMail is the best business email provider for organizations with international workers. FastMail offers three service plans: Basic for $3 per user, per month, Standard for $5, and Professional for $9. Each plan includes cloud storage, mobile sync, personal support, and is ad-free with no tracking. FastMail pricing is similar to Rackspace but supports more languages. FastMail’s Basic plan includes 2GB of cloud storage per user for $3 per user, per month. All FastMail service plans support 36 languages while email providers like Office 365 and G Suite support around 25. It also features an ad-free experience, personal support, and full mobile sync with mail, contacts, and calendars. This level doesn’t allow users to bring their own domain or include a data retention policy like the upper tiers. It also doesn’t offer Microsoft Office-compatible apps like Rackspace’s similarly priced plan. With its small amount of storage and limited features, FastMail’s Basic tier is best for freelancers, solopreneurs, or teams that don’t use email as their primary means of communication with customers and team members. FastMail’s Standard plan includes everything the Basic plan offers and increases cloud storage to 25GB per user for $5 per user, per month. 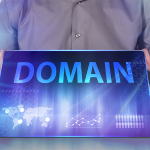 It also allows customers to use their own domain, making this plan is right for businesses wanting email addresses that match their website domain name. This plan doesn’t include unlimited archiving space that comes with the highest service plan. It also doesn’t include unlimited storage like the Bluehost plans in this price range. However, its 25GB of storage space is comparable to what Rackspace offers. FastMail’s Professional plan includes the features of the Basic and Standard plan but increases storage to 100GB per user at a cost of $9 per user, per month. It also features unlimited archiving space with flexible data retention policies, making the Professional plan right for organizations that must retain emails to meet compliance regulations. This service plan doesn’t offer integration with third-party archiving tools. However, G Suite’s archiving and integration tools are only available on plans with a high price tag than FastMail’s Professional plan. FastMail doesn’t offer G Suite integration or ediscovery tools like Zoho Workspace’s service plans. It also doesn’t feature access to Microsoft Office apps like Rackspace and Office 365. FastMail users are overall happy with the email provider, saying it is intuitive and easy to use. They also say its spam filter is effective at keeping unwanted emails from the inbox. However, some FastMail customers are frustrated by the lack of folders to keep email neatly organized and searchable. Companies that need the best email provider that supports a wide range of languages should give FastMail a try. The company offers a 30-day free trial of its Standard plan for up to five users. Visit FastMail to learn more. Email is one of the most critical tools for modern business. The best email providers offer generous storage space, collaboration and productivity tools, email aliases, and robust spam and virus protection. We believe that G Suite offers the best value for the price due to its overall reliability, available productivity tools, best in class security practices and ease of integration with other products. Visit G Suite’s website today to sign up for a free 14-day trial. instant bulk smtp is also the best email marketing service provider.